Stonemasons working at Exeter Cathedral have finished restoring a damaged statue from one of the building’s war memorials, just in time for the commemorations of the centenary of the Armistice. 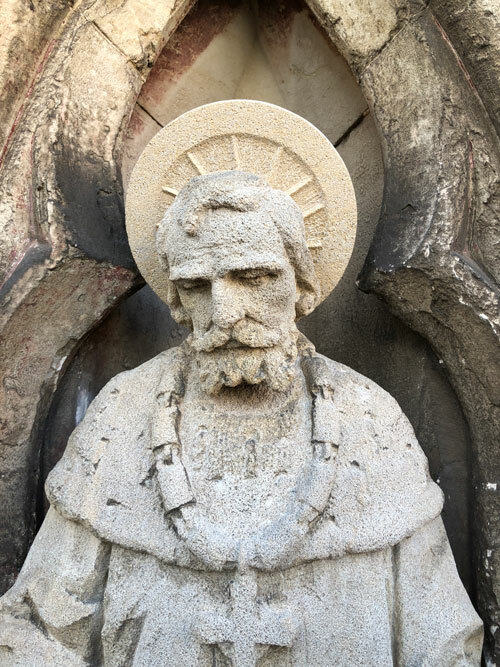 The statue of St Vladimir, one of a group depicting the patron saints of the western allies from the First World War, was dislodged from the north side of the medieval building during a late-night act of vandalism in July this year. 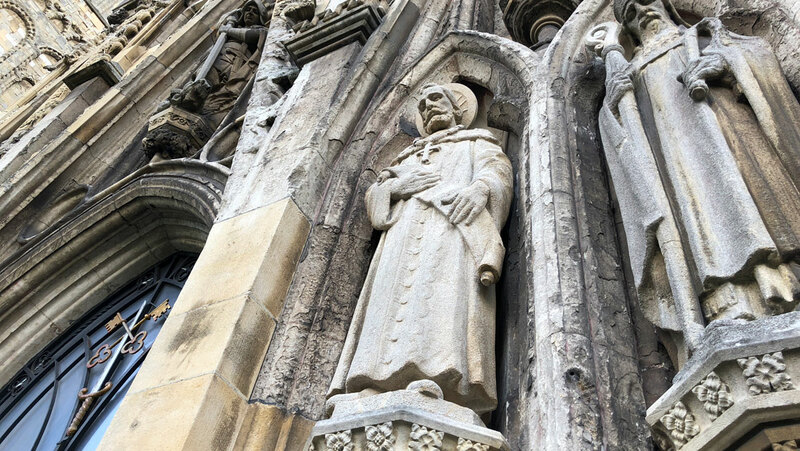 Originally installed in 1920, it has been painstakingly restored and cleaned, and was fixed back onto the ‘north porch’ of Exeter Cathedral earlier this week. Restoration work included a complete reconstruction of the halo, and reattachment of the head, both of which were badly damaged. 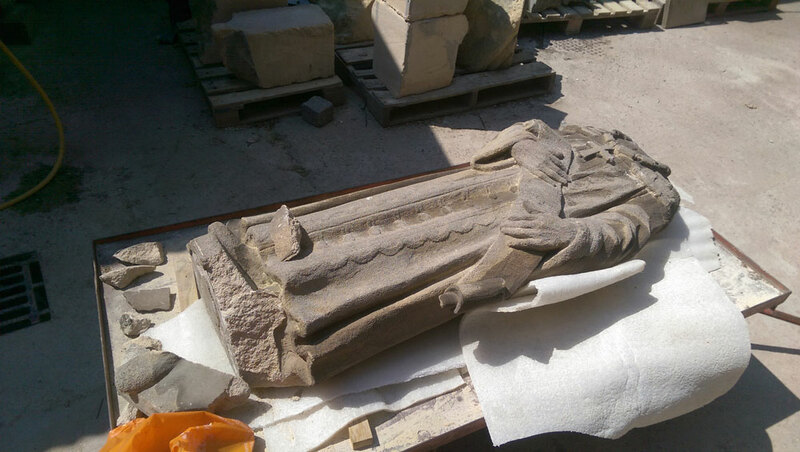 The Cathedral’s stonemasons also took the opportunity to clean the stonework, before the statue was reattached on Thursday morning. The work was partly funded by donations from members of the public, and was inspected by the Dean of Exeter, the Very Revd Jonathan Greener, before scaffolding was removed. Exeter Cathedral will become the focus of the city’s Remembrance Sunday commemorations next month, with a host of special events, lectures and acts of worship taking place. Newly restored and mounted on the North Porch. 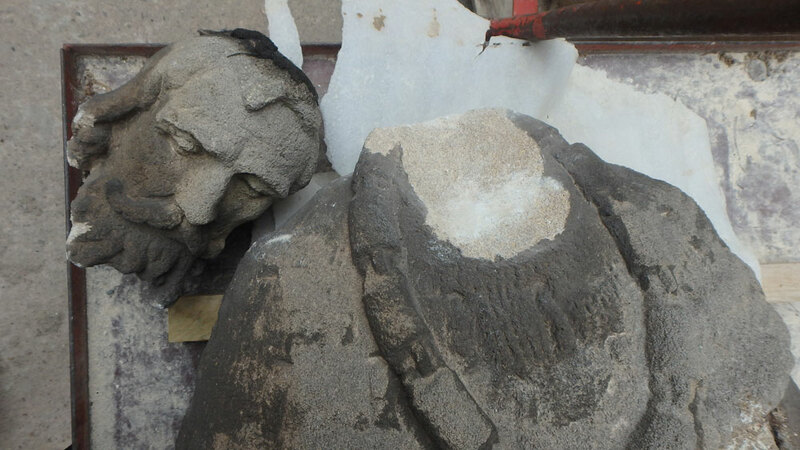 The statue removed to the stonemasons’ yard. Close-up showing some of the damage.